Detail from the cover of Hex Wives #1. Maybe you know Ben Blacker as half of the creative team that spawned The Thrilling Adventure Hour. You might have watched some of the episodes of Supernatural that he helped write. Or maybe you read the Deadpool, Star Wars, or Wolverine series he’s co-written. His next comics work is like nothing else he’s ever done. Announced months ago as part of a relaunched Vertigo imprint, Hex Wives teams Blacker up with Bombshells artist Mirka Andolfo. At this year’s San Diego Comic-Con, Blacker talked to me about the series’ strong metaphorical hook and the kind of audience he’s hoping Hex Wives will appeal to. io9: I know descriptions have been put out for all these new Vertigo books, but I want you to describe what the high concept of Hex Wives is. Blacker: I think all of these new Vertigo books, which are all so good, have this in common: They have this high concept, but [then there’s] also the thing that they’re really about, thematically. With Hex Wives, the high concept is, what if Samantha from Bewitched didn’t know she was a powerful witch? What if she’d been held as a suburban housewife against her will? And so, the first arc is a literal story of empowerment. She’s discovering she has these enormous, magical powers. What the book is actually about is the insidious ways men control women. The full cover for Hex Wives #1.
io9: There’s been a lot of talk about own voices and diversifying the creative corps of various media. Do you have any trepidation in the symbolic power of a story like this, and the fact that you’re a man who is telling it? Blacker: Every day. From our very first conversations with Mark Doyle at Vertigo, it was important to me to have as many female voices on the book as we could get, in order to capture the true experience of being a woman among men. I can have as much empathy as a writer as possible, but I’m still a white man. So it started with our editors. Mark put me with Molly Mahan and Maggie Howell, who are unbelievable collaborators and, honestly, all the good ideas come from them. I was there for the beginning, but that’s it. But then we brought on Mirka very early...and she’s had an enormous voice on the book. Our colorist, Marissa Louise has an enormous voice on the book...the things these women are doing for this book is only making me look good, and I feel kind of bad about that? io9: Mirka, I’m most familiar with your work on Wonder Woman/Shade the Changing Girl and Bombshells and you’ve developed a very unique visual language to express madness and emotional responses in a metaphorical way. Are you able to use that same tool set on Hex Wives? Mirka Andolfo: Yes. I play a lot, especially, with the expressions of the characters. I think they are very important. And I try to talk through that, with their body language especially, to emphasize strong emotions like when they are worried or scared. It’s very enjoyable. Andolfo: Especially Isi. The main character, Isadora, is very dark. Scenes from a violent past in Hex Wives #1.
io9: Ben, People probably know you best from Thrilling Adventure Hour but this isn’t your first time in the medium. When you go into comics, what part of your brain do you have to reconfigure to tell stories? Blacker: Oh, man. I was lucky enough to be friends with Len Wein, who is like, the warmest, loveliest guy and a great loss for us in the comics community. And when I started writing comics, I sat down with Len and said, “Tell me everything—you’ve been doing this for 50 years.” And the best piece of advice he gave was, “Writing comics is like looking at a film strip, and picking the one image that best tells the story”. Having now worked on a bunch of comics, and with other TV writers who have come to comics, the thing I see most often is people trying to do two things in a panel. It’s those little things that are unique to comics and make them really great. It’s this almost haiku of storytelling...and it’s so much harder...you can’t go on and on, as I tend to do. You really have to be so disciplined in the medium. And when you’re hooked up with an amazing artist like Mirka, you just want to let them run free. For me, now, the game is like, “What fun sequence can I come up with?” Because I want to see her execute it. io9: What’s your favorite thing that you’ve drawn so far? Andolfo: I really like the characters. I’m always in love with the characters in general. Those girls in this comic are especially badass. And that’s my favorite part. I always enjoy drawing backgrounds, but backgrounds are much harder, you know? Oh, and their clothes. This comic, the clothes are very important. I had to do a lot of research [on things like this] for our story, it was very interesting. Blacker: I want to mention this one thing—I like io9 so I want to tell you guys—when Mirka was doing the character design, we had the idea that part of the story is these women realizing their power and breaking out of where these men are keeping them. And so I had this idea that maybe they would appropriate the men’s clothes, because that was all they had that wasn’t this Mad Men-style, 1950s and ’60s clothing. And so Mirka did some unbelievable design on Izzy, the main character—with the jacket? Do you know what I’m talking about? Blacker: Do you want to talk about that? Andolfo: Yeah, I tried to draw this kind of a outfit that I think could also be worn by a real person. Also, I wanted something that a cosplayer, for example, can do it. Everything made from normal clothes. [The outfits] are weird because the characters make them particular. Emotions run hot during a meeting of the Architects. io9: You have these women coming into their own power and, you know, it feels like the easy way into that is to make the men in their lives horrible people. Are you complicating the male characters any way? Are we ever going to feel sympathetic for them, or are they fucked-up jerks? Blacker: Yeah, absolutely. It’s the old writer’s adage [that] no villain thinks he’s a villain. It was important that we understand—maybe not sympathize, but understand—all these characters and why they’re doing what they’re doing. Especially in this first arc. It’s still kind of monstrous but, I think as we go on, we’re going to see shades of, “They’re not a monolith.” And again, I have trouble sympathizing with them, but I can understand why the Architects (that’s what they’re called) are doing what they’re doing. io9: Where do we find Isi at the beginning of the series? Blacker: It’s a complicated question. I might give too much away. When we meet her, we understand that she is a powerful witch. We understand that her specialty power is an extreme capacity for violence. And then, when we meet her again in the first issue, she is sort of a Betty Draper type. She is the suburban housewife—a little bit bored, very doting to her husband, as are all the other witches in her coven. So we see them in this unusual circumstance, and the story is them figuring out what they have and what they are. io9: Witchcraft gets used a lot in genre fiction. Tell me about your research to find a kind of texture for witchcraft that didn’t feel overly familiar from other stories. Blacker: Yeah, both in Thrilling Adventure Hour and then in this book, we did a lot of research into the tropes of these power things. And with witches, there’s no one witch story. It’s a really unusual horror trope. There’s pointy hats, there’s broomsticks, there’s some blood magic very often, but not always, and that’s something we use. For me, in creating this coven of witches, it was looking at pop culture witches I love, because Bewitched was the jumping-off point. So, looking at Sabrina the Teenage Witch, and figuring out how do we do our version of Sabrina. I Married a Witch is a great movie that was fun to watch again. I like what they did with the witches from American Horror Story. It was a messy jumble of tropes, but I feel like they got so much right. Ursula, the Sea Witch from The Little Mermaid, is in there, too. io9: Do you get to draw any monsters? Andolfo: There is a character. [To Blacker] You know which one. Very ugly, but not a monster. Maybe in the future. Blacker: It’s coming. I don’t tell her what’s coming. I script a script like it’s a soap opera. 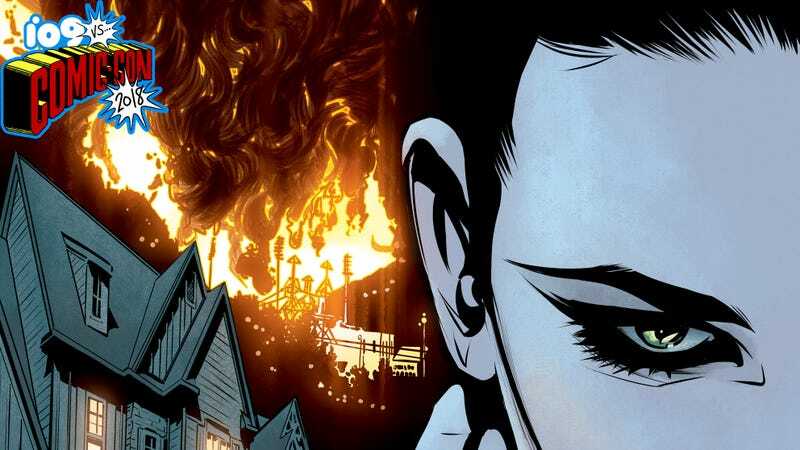 io9: Is there an audience that you feel like isn’t reading comics right now that you want to reach with Hex Wives? Blacker: Yeah, I think that’s kind of the thing with the whole Vertigo re-launch and all these books. I think comics-reading audiences will love them, because they’re like, everybody working at the top of their game. But they all have the potential to bring in an audience outside of comics. I mean, I talk about Buffy the Vampire Slayer as a huge influence on this book in that it’s about a powerful woman, and powerful women. It’s an ensemble book. And there’s human drama and horror and enormous stakes for these characters. I feel like that Buffy audience, who has become the CW audience, who has become in many ways a Netflix audience—those are the people I’m writing for. Which is me. You know? And I think that’s what all the other writers are doing. Hex Wives #1 goes on sale this October 31.